After the death of Dr. Thackery T. Lambshead at his house in Wimpering-on-the-Brook, England, a remarkable discovery was unearthed: the remains of an astonishing cabinet of curiosities. Many of these artifacts, curios, and wonders related to anecdotes and stories in the doctor's personal journals. Others, when shown to the doctor's friends, elicited further tales from a life like no other. Thus, in keeping with the bold spirit exemplified by Dr. Lambs­head and his exploits, we now proudly present highlights from the doctor's cabinet, reconstructed not only through visual representations but also through exciting stories of intrigue and adventure. A carefully selected group of popular artists and acclaimed, bestselling authors has been assembled to bring this cabinet of curiosities to life. 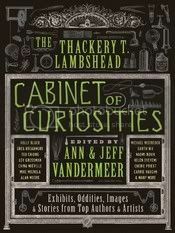 The Thackery T. Lambshead Cabinet of Curiosities will be released on July 12, 2011 from Harper Voyager.